The diplomatic cold shoulder Israel has received from African, Asian and Arab countries has been thawing in recent years, and a former Israeli ambassador to the United Nations says the situation is even more encouraging under the radar screen. Ambassador Ron Prosor, who was the Jewish state’s representative at the world body from 2011 to 2015, spoke at the Jewish National Fund of Canada’s Negev Gala Sunday night. The UN General Assembly is a den of hypocrisy, Prosor said, citing the presence of the most oppressive countries on committees dealing with human rights. The UN Human Rights Council has been dominated by states with the world’s worst human rights records. Moreover, the council, which is supposed to be concerned with human rights abuses all over the world, has a specific article that singles out only one country for routine, ritual denunciation. “Surprise, surprise – Israel,” Prosor said. “The structural and institutional bias against Israel is unbelievable. There is stuff that I can’t even invent. The Saudis chairing the conference on the status of women. The Iranians … they’re deputy chairs on nonproliferation and arms control. European nations and some of the other democracies that make up a minority of the countries at the General Assembly routinely side with despotic regimes against Israel. In such a situation, small victories count heavily. Prosor took heart when countries opted to abstain from votes rather than side against Israel. He shared an anecdote about Pablo, the ambassador of Panama, an apparent reference to Pablo Antonio Thalassinós. “‘Pablo, are you with us on this vote? Are you going to vote for us?’” Prosor recounts asking. “‘No. How can I vote? The Arabs are threatening me. What do we do?’ I look at Pablo. He looks at me. I say, ‘Pablo, I feel you’re beginning to catch the flu.’” In the story, the Panamanian begins to cough. Prosor shared stories of similar conversations with other ambassadors, convincing them to abstain or not show up for votes, and even making him their proxy vote in these latter instances. While a great many votes relating to Israel are still deeply lopsided, he said, ambassadors like him have helped some others understand that abstaining is better than a no vote. Behind the scenes, Israel is not the isolated pariah it appears, he contended. For example, Prosor said, India’s relationship with Israel has grown very warm in recent years. Relations between Israel and the Sunni Arab world are changing dramatically, he said, due to shared concerns over the Shiite theocracy in Iran. Prosor remains defiant despite the pillorying his country continues to receive at the world body. Of the 193 countries at the UN, he noted, only 87 are democracies. Twenty-two are members of the Arab League, 56 are part of the Organization of Islamic Cooperation and 126 countries are part of the so-called nonaligned group. By contrast, Israel is the only country at the UN that is not a part of any regional grouping. This means Israel cannot sit on any committees or subcommittee of the body. In such a context, he said, humour and sarcasm go a long way. Elon Gold, a comedian who followed Prosor on the bimah Sunday, remarked that the ambassador was funnier than he was. Prosor shared stories of what seem like diplomatic pranks. Overall, the ambassador said, things that are not clearly visible bode well for the future. “Under the radar screen, there is huge support for Israel,” he said. But, he warned of evolving tactics by Israel’s enemies to weaken it. “The battle that we are in may be the toughest battle that we’ve been in since the beginning of the state of Israel,” he said. “They tried to take us out with military means and that didn’t work out. They tried economic boycotts. Today, they are trying to put a wedge between Israel and the Jewish communities abroad, going after the mutual values that we all respect, that we all live with. It’s lies, half-truths, Chinese torture – drop, drop, drop – and we have to be out there and call it and fight it and not look away. We have to confront it and work together. In addition to comedian Gold (see story, jewishindependent.ca/jnf-gala-features-comic-gold), the evening featured a few speakers, including Sanford Cohen paying tribute to the philanthropic work of honourary event chairs Bob Markin and Ralph Markin at a gala dinner before the main program, and JNF Pacific Region president Bernice Carmeli offering remarks at the dinner and during the program. Schara Tzedeck’s Rabbi Andrew Rosenblatt spoke about humour in Jewish theology. Actor and writer Josh Epstein emceed. Shannon Gorski chaired the event and Shirley Hirsch was convenor. Ilan Pilo, Jerusalem emissary and executive director of JNF Pacific Region, recognized past president David Goldman. 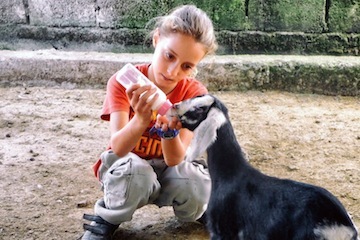 Funds from the event will support an animal-assisted therapy centre in the city of Sderot, where children and adults live with post-traumatic stress disorder due to years of rocket and mortar attacks from nearby Gaza. The project was described to the audience by Lance Davis, chief executive director of Jewish National Fund of Canada. What constitutes a genocide? How many Ukrainians were murdered by Josef Stalin’s human-created famine in the 1930s? Would you stand up in a situation where lives were at risk – even if it meant you might become targeted? These were some of the questions confronted by Grade 12 students of King David High School last week. A national educational tour about the Holodomor – the mass murder of Ukrainians by the Soviet regime – pulled into Vancouver, opening the eyes of young people to this chapter of history. Beginning in 1932, the Soviet government under Stalin began a calculated, systematic famine in Ukraine, seizing all food sources, cutting off escapes for people fleeing starvation and implementing summary execution for the crime of stealing the smallest piece of sustenance. Farming was collectivized, creating catastrophic conditions. Political and intellectual elites were murdered. Some details, including the number of Ukrainians killed, remain cloaked in uncertainty because, from the start, the Holodomor was deliberately hidden from the outside world through a comprehensive system of censorship and misinformation, as well as the complicity of media and other countries. Estimates of the number of dead range from seven million to 14 million. 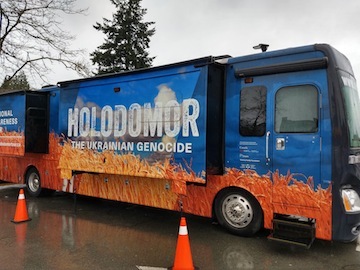 The Holodomor National Awareness Tour consists of a bus-sized repurposed former recreational vehicle. 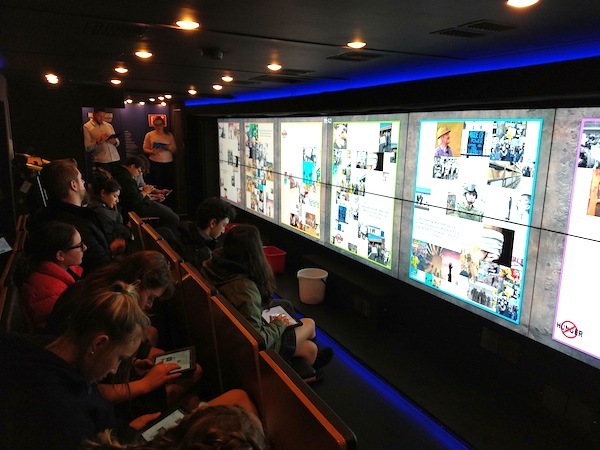 Rather than a static exhibition through which participants walk, the vehicle has been retrofitted with a 30-foot screen down one interior wall and 30 theatre-style seats down the other, with interactive tablets that invite students to study and discuss in small groups before reconvening to share what they’ve learned with the larger group. A project of the Canada-Ukraine Foundation, the tour began in 2015 and has reached about 30,000 Canadian high school students so far. The Holodomor was not an endeavour to kill an enemy, but an effort to restructure society, a form of social engineering at its most extreme. In September 1932, Stalin wrote to one of his lieutenants that Ukraine was restive. The Soviets perceived Ukrainians as being profoundly religious, individualistic, believers in private property and attached to their plots of land, making them unsuitable for building communism. Addressing these perceived flaws would require, according to Soviet leaders, an action so extreme that a word had not yet been invented to describe the intent. The entire agricultural sector was upended by collectivization and resisters were murdered or sent to gulags, Soviet concentration camps. At first, remaining supplies of food sustained the Ukrainian people, but those reserves were soon depleted, while the Soviets extracted ever-increasing quotas of grain and Soviet wheat exports to the West grew. As the Holodomor proceeded, NKVD secret police were sent to search for and confiscate any remaining food sources. While those caught stealing or concealing food were executed, for millions more, fate was less sudden. Students examined the forces that allowed the Soviet Union to hide the reality from the world. For the Soviets’ part, there was censorship and the threat of retaliation for those who shared the truth. But their crimes were abetted by Western figures, including New York Times correspondent Walter Durante, who won a Pulitzer Prize for his reporting from the USSR, even as he misrepresented the Holodomor. In one article, titled “Hungry, not starving,” Durante wrote that there is no actual starvation or death from starvation, though he acknowledged there was widespread mortality from diseases due to malnutrition. Leading journalism figures from the time are brought to life through reenactments. British journalist Malcolm Muggeridge, reporting for the Manchester Guardian, reflected on being raised in a socialist household and how he was enthusiastic about traveling to the Soviet Union to report on the utopia being created there. When he saw the reality, he evaded Soviet censors by sending his dispatches home via the British embassy’s consular pouch. One of the heroic figures of the story is Gareth Jones, a Welsh journalist who risked his life to bring the truth from Ukraine. He convened a press conference in Berlin, on March 29, 1933. But the timing was terrible. The Soviets were about to launch a show trial against six U.K. citizens, accusing them of espionage in what would become known as the Metro-Vickers Affair. In order to remain in the USSR and report on what promised to be a trial of global importance, journalists had to stay on good terms with the authorities. Lauren Shore is a student in King David’s Holocaust and Genocide Studies 12 course. 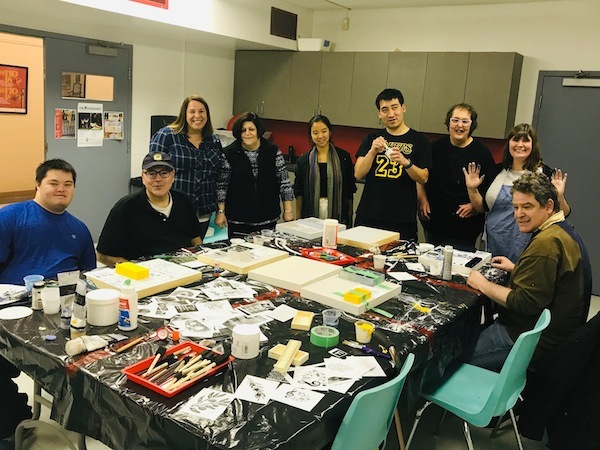 The class, created by teacher Anna-Mae Wiesenthal, is delivered during lunch hour and, while students receive credit, they take the course in addition to their full complement of other classes. A province-wide genocide studies elective course is part of the new B.C. curriculum and will be offered next year at schools that opt-in. Shore, with a partner, did a project on the Holodomor. Solly Khalifa, also in Grade 12, was impressed with the interactivity of the Holodomor tour. Classmate Noah McNamara saw parallels between the Holodomor and the Holocaust. The cross-country tour operates with a shoestring staff. Alexi Marchel leads students though the experience. Kevin Viaene drives the bus and supports the program. Elan Divon has found his passion and purpose in life – helping people to find their passion and to confidently fulfil a purpose that not only builds their own positive energy but also lets that energy spill out to improve the world in both small and potentially large ways. He began by sharing the story of avoiding a deadly suicide bombing by sheer coincidence. Twenty years old, a soldier in the Israeli army, he had just returned home and was on a date at a café. The woman wanted ice cream instead, so they left; moments later, they heard three bombs go off, many people were killed, hundreds were injured, in the area they had just been. The experience jolted Divon onto a path of self-reflection and a search for spiritual meaning. He went to study abroad, later quitting a Wall Street job and then studying archeology and anthropology at Brandeis University, followed by comparative religion at Harvard University. Divon explained to the audience at KDHS that he feels he has found his purpose and can, therefore, live his purpose and make every moment count. He wants others to be able to do the same. 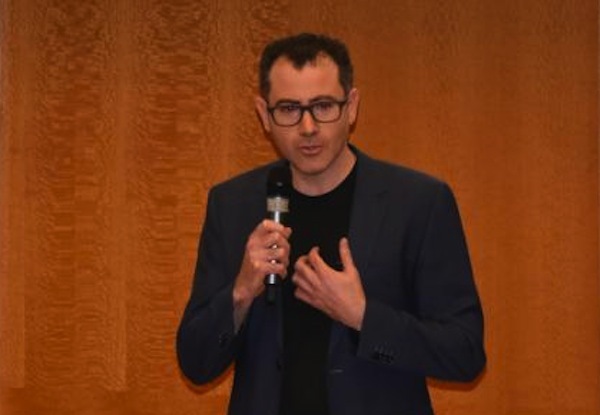 He spoke about what he called a “stress epidemic” and identified five key aspects that inhibit personal growth and cause poor performance for students and adults alike. The first factor is how much technology has invaded our ways of behaving and thinking. “Because of technology, people feel that everything needs to happen instantly,” he explained. With smartphones and constant access to the internet and apps, people find the answers they are looking for without really having to search, and they communicate with others without really having to interact. “Our outer reality works very quickly but our inner reality takes time to develop,” he said about why this causes stress. Using the example of gestation, Divon explained how certain biological functions cannot be rushed – by technology or just because we shower them with attention. It takes time and experiences – both positive and negative – to build the necessary skills for human interaction and resilience, to be a well-rounded and confident person, he said. The culture of comparison that dominates the internet is the second challenge. Before the advent of the internet, said Divon, a person might compare themselves to their sibling, a neighbour or the most impressive student at school. Today, we see carefully crafted virtual personae online from all over the world, and use those as a totally unrealistic benchmark for self-comparison, he said. Next, Divon focused on the benefits that can be gained from discomfort. “Parents need to give their children space to solve their problems themselves,” he said, noting that, currently, teens can avoid uncomfortable situations by hiding behind their over-involved parents or their phones. Social isolation – Divon’s fourth area of concern – can result from living a virtual life. Without direct personal contact, he said, people suffer all kinds of stress. Age-old ways of coping with painful situations or celebrating happy moments are eliminated by text communication. “Studies show that when good news is shared via text, it’s like it didn’t happen, even when the recipient of the text responds. Only through personal contact do people feel supported and connected,” explained Divon. Finally, he said that overstimulation is damaging everyone. “We are drowning in information but starving for wisdom,” he said. Divon outlined three ways to enhance happiness and purpose in life. First, we need to have a proactive rather than a reactive mindset, he said. Using the establishment of the state of Israel as an example, Divon explained how the nascent state was able to turn a rocky beginning into a success. Rather than focus on the paucity of resources and abundance of hostile neighbours, those who established the modern state of Israel were optimistic and counted their blessings. “Being a victor over circumstances rather than a victim of circumstances is what sets people with a positive mindset apart from those with a negative one,” said Divon. A positive mindset helps build the second key factor: relationships. A strong – real, not virtual – support group is a protection from stress, it helps most people find their jobs and determines and gives meaning to life, said Divon. The third component to finding contentment and productivity is stress management. “Stress is resisting what is in a present moment,” Divon said. If stress is resistance and 95% of stress occurs in the mind, it is possible to eliminate or manage most of the stress we perceive in our lives, he explained. While the steps needed to manage stress are not easy, Divon said that, with practise, step-by-step, people of all ages can change their habits and develop more effective ways of coping. Neuroplasticity is the ability of the brain to adapt and change. Divon explained that, although there are many stressors and that technology is often our foe instead of our friend, we can all develop new pathways in our brain. We can enhance the quality of energy we possess and make ourselves and those around us happier. Michelle Dodek is a freelance writer living in Vancouver, and the mother of a 12- and a 13-year-old. Xianzhi (Paul) Chen came to Canada from China in 2011 with his family. He loves outdoor sports, especially basketball, and has always been community-oriented, including providing care for Chinese seniors at a nursing home. But how did he find his way to the Jewish Community Centre of Greater Vancouver? Paul is pursuing a recreation and leadership diploma at Langara College. Last year, he approached six organizations for an internship, to apply the training and skills of this program to a real-world environment, but was turned away by all the organizations he approached. When he initially interviewed for a position at the JCC with Lisa Cohen Quay, Adult 55+ program coordinator, she also said no. However, the issue was not whether he could do the work required, but rather that the requirements and expectations of the Langara internship were too much for her department to oversee. Paul is blind in one eye and has limited vision in the other. He requires accommodations. But accommodations were not the issue either. Lisa’s mom lives with extremely low vision. She knew that, with slight adjustments to the work environment and access to a CCTV machine and specialized software like ZoomText, Paul would be able to meet and even exceed expectations. His disability, as so often is the case, was not the barrier. Fortunately for the JCC, Paul would not take no for an answer. Without an internship, he would have had to delay the completion of his education. So, he wrote Lisa after that first meeting and asked her for a chance to show his skills. Paul – bright, friendly and tenacious – left a powerful impression. Lisa could not stop thinking about his abilities and the challenges he had faced. Determined to provide him with a meaningful and useful internship, she reached out to me, the coordinator of the JCC’s inclusion department, to see if we could create one between our two departments. We did just that, agreeing to co-supervise Paul’s internship. We decided to provide him with program planning experience and program support experience, while also allowing him to actively participate in some of the JCC’s inclusion programming. Lisa then reached out to the Langara internship coordinator to negotiate a modified internship for Paul. The school agreed to Paul interning between the two departments at a reduced load over a longer, five-month period. Paul was very nervous at first. He did not know how to set up for events like mah jongg, poker or bridge, how to manage a budget or how to plan programs. But, he took instruction well, was eager to learn and did his best. He demonstrated care in all his interactions with community members and poured his heart into every project in which he participated. 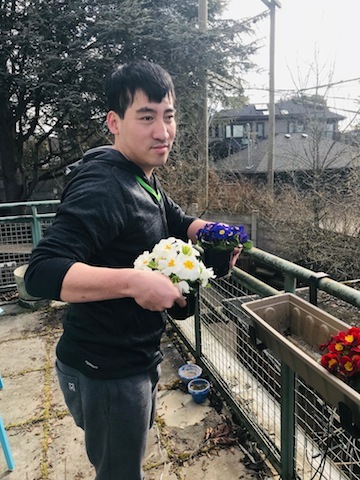 “I oversaw Dumpling Night at the Community Kitchen to share the Chinese New Year with community members,” said Paul by way of an example of how he incorporated his previous experience into his internship at the JCC, and learned more about leading programming. Paul tried many new activities during his internship and, as a result, made a lot of friends. He learned quickly that friendships are forged through recreation. The JCC is proud to have been part of Paul’s training and professional development. We are happy to have provided him with a meaningful and diverse introduction to recreational programming, to community building and to leadership development. We are equally grateful for what he has given back to our community and us as professionals, and hope that he will continue to participate in our community and lead programming in the future. Access to opportunity, we are reminded, requires adjustments and flexibility and is always worth the effort. Leamore Cohen is inclusion services coordinator at the Jewish Community Centre of Greater Vancouver. 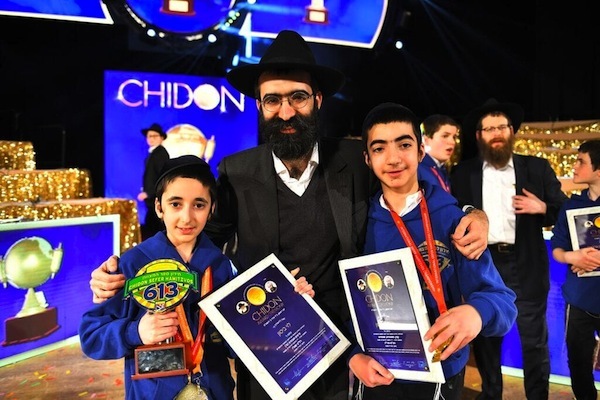 Seven months of diligent study came full circle April 7 for Mendel and Levi Bitton of Vancouver and more than 1,200 of their peers at the final round of the annual International Chidon Sefer Hamitzvos in Brooklyn, N.Y. Of close to 10,000 children from more than 150 schools worldwide who participated in this year’s competition, Mendel and Levi earned two of the highest scores on three rigorous exams, qualifying them for a trip to Brooklyn to participate in the final tournament. Also earlier this month, more than 1,400 girls participated in their own similar showdown. The Lubavitcher Rebbe, Rabbi Menachem M. Schneerson, OBM, encouraged children to thoroughly study all of the Torah’s 613 commandments as enumerated and elucidated by Maimonides in his Sefer Hamitzvot. His followers have taken to his words, hosting an annual chidon (contest) that challenges children to study large volumes of detailed texts delving into the intricacies of each mitzvah, and compete for trophies, medals and prizes. Organized by Merkos L’Inyonei Chinuch, the educational arm of the Chabad-Lubavitch movement, together with Tzivos Hashem, its children’s division, the Chidon Sefer Hamitzvos sees thousands of children ages 9-13 staying late at their respective schools to study the mitzvot with their classmates and friends. As finalists, Mendel and Levi flew to New York, where they enjoyed four days of trips and competitive games that tested their knowledge, and concluded with a grand on-stage tournament and award ceremony. In the final moments, the tension rose and the crowd went silent as the emcee opened the long-awaited envelopes and announced the trophy winners and champions of the final exam. We are proud to report that Levi earned a silver trophy. We are also proud to report that Mendel was among 15 boys, from grades 4 to 8, who completed the entire Chidon curriculum. Mendel earned a medal celebrating his commitment and all those months of hard work. Mazal tov to Levi, Mendel and all of the competitors! For more information on the contest, visit chidon613.com. Alison Snowden and David Fine’s National Film Board animated short Animal Behaviour won for best animated short at the Canadian Screen Awards March 31. The film also was an Academy Award nominee this year. It is the fourth Oscar nomination for the Vancouver-based husband-and-wife animation duo, who took home the Oscar 24 years ago for the NFB-Snowden Fine Animation-Channel 4 co-production Bob’s Birthday. They were also nominated for their 1987 NFB short George and Rosemary, with Snowden nominated before that for her 1984 student film Second Class Mail. 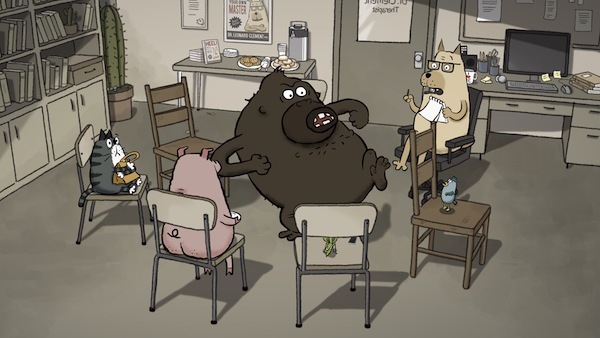 Animal Behaviour takes viewers inside a group therapy session for animals who grapple with issues not unlike our own. (See jewishindependent.ca/animated-therapy-session.) Produced and executive produced by Michael Fukushima for the NFB’s Animation Studio in Montreal, Animal Behaviour is the 75th Academy Award nomination for the NFB – more than any other film organization based outside of Hollywood. The NFB has received 12 Oscars over its 79-year history, including a 1989 Honourary Academy Award for overall excellence in cinema. 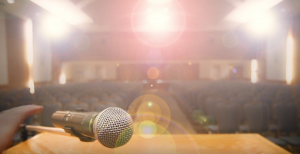 This screenshot from the 30th anniversary video of the Public Speaking Contest shows participants’ excitement. Larry Barzelai can be seen at the back of the crowd on the right. 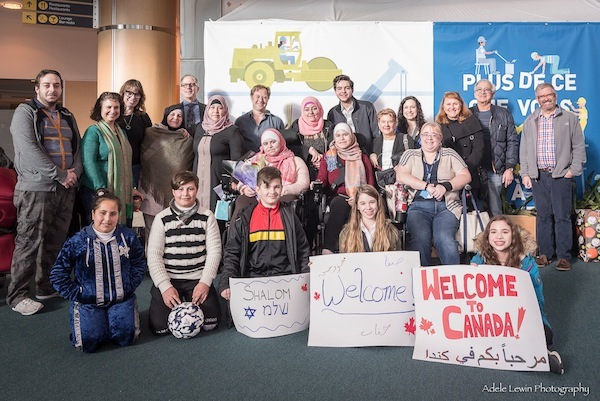 On March 14, about 90 young participants and their families and friends, as well as volunteer judges and moderators and others from the Jewish community gathered for the annual Public Speaking Contest, presented by Jewish Federation of Greater Vancouver and State of Israel Bonds. “This contest was established in memory of my father, Morris Black, who left money in his will to support such a contest,” Larry Barzelai told the Independent. 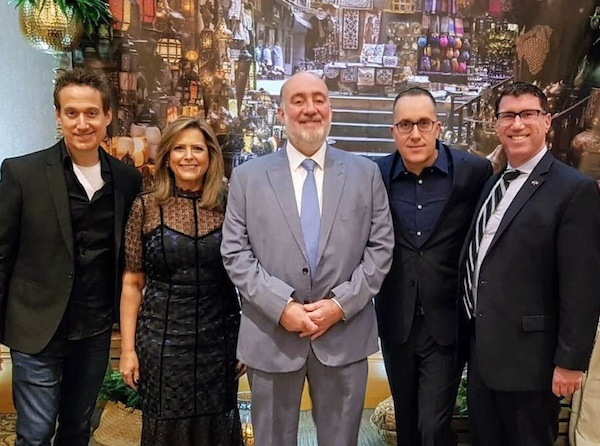 “It has morphed from a Peterborough-based essay contest for famous people in Jewish history, to an Ontario-based essay contest, to a public speaking contest in Hamilton (run by my brother Rick) and the present public speaking contest in Vancouver. I give credit to my brother Rick, who originally came up with the idea of a public speaking contest in Hamilton, where he lives, and I started the contest in Vancouver a few years later. This year’s Grade 4 through Grade 7 participants came from Gilpin Elementary School, Richmond Jewish Day School, Temple Sholom Religious School, Vancouver Talmud Torah, Vancouver Hebrew Academy and West Point Grey Academy. Some of the public school entrants may also attend a synagogue school. Speeches had to run less than three minutes, but could cover any topic. Students were given a list of suggestions, such as the following: What is your favourite Jewish holiday and why? Describe a family member or someone from Jewish history and tell us why you admire them. Israel is often described as the “start-up nation” – name something invented in Israel and discuss how you think it has made a difference to people’s lives. Reduce, reuse, recycle are terms used to describe how people protect the environment – tell us about two Jewish values that you feel are connected to environmental protection. If you only had time to visit one city in Israel, which city would it be and why? Lissa Weinberger, manager of Jewish education and identity initiatives at Federation, is in charge of managing the literally hundreds of moving parts of the machine the contest has become. She provided the Independent with the list of winners for this year’s event, though the contest organizers rightfully stress that every participant is a winner for having participated and put in the work. Last year, to celebrate the contest’s 30th anniversary, Barzelai had a video created. Written and directed by Adam Bogoch and edited by Thomas Affolter, the video gives a brief history of the contest, shows clips of the 2018 event and features interviews with the students, community leaders and volunteers, including Barzelai’s spouse, Rhona Gordon, who is an advisor on the project and is always on hand to help give out the awards on contest night. This year’s awards went to, in Grade 4: Myelle Leung (1), Lia Golik (2) and Miri Grad (3) in Group 1; Miriam Ora Yeshayahu (1), Arlo Foxman (2) and Yanky Baitelman (3) in Group 2; and Naomi Bernal (1), Hannah Pressman Chikiar (2) and Jake Silver (3) in Group 3. In Grade 5, the winners were Mira Hurwitz (1), Baila Shapiro (2) and Anne Cohen (3) in Group 1; Adina Ragetli (1), Sophie Rossman (2) and Jakob Murphy (3) in Group 2; and Sarah Malul (1), Hannah Setton (2) and Hannah Norden (3) in Group 3. In Grade 6, winners were Chaya Malul (1), Eden Almog (2) and Tamir Gini (3) and, in Grade 7, they were Chasya Berger (1), Rivka Feigelstock (2) and Max Dodek (3). For more about this year’s contest and to watch the 30th anniversary video, visit jewishvancouver.com/psc2019. 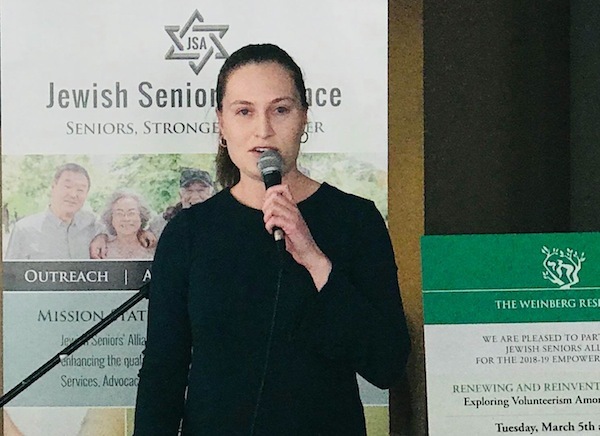 The following talk was delivered March 5 at the third session of the 2018/19 Jewish Seniors Alliance Empowerment Series, which took place at the Weinberg Residence. Speakers also included Larry Shapiro, JSA’s second vice-president; Jessica Bruce, volunteer coordinator for the Weinberg and the Louis Brier Home and Hospital; and Vanessa Trester, manager of the Weinberg. It is relatively common knowledge that volunteering provides tremendous benefits to individuals and to the community at large. Volunteers have the opportunity to bring an increased sense of meaning and purpose to their lives, expand their social network, exercise unique skills and hobbies and, of course, help others in need. The presence of volunteers within a community increases social cohesion, builds trust and creates a “social infrastructure” of support, reciprocity and concern for others. But what do volunteer roles really mean to those who participate in them? How does one start volunteering, and why do they continue? The Jewish community is exemplary in its provision of services and volunteer opportunities for children, youth, adults in mid- to late life, and the elderly. Yet the personal experiences of those who volunteer in the community, from a research standpoint, are largely unknown. This fact, along with my own experiences of working and volunteering within the community, inspired my master’s thesis, titled, An Exploration of Pathways, Motivations and Experiences Among Older Jewish Volunteers in Vancouver. The findings reflect interviews with 21 volunteers. The majority of participants have volunteered for most of their lives. They described having parents who were community-minded, as well as adolescent experiences of being a part of Jewish youth organizations or women’s groups dedicated to community service. The expectation from others to volunteer was also discussed. Often, participants were asked to volunteer by their peers, rather than having sought out opportunities themselves. Over the years, this allowed them to experience multiple volunteer roles, as they would often be exposed to another role as a result of their status as a volunteer in the community. Participants found volunteering to be personally rewarding, describing how their roles made them feel better about themselves, kept them busy and productive, as well as mentally fit. Participants were also motivated to volunteer for generative reasons; that is, to help the next generation and the community at large. The desire to pass on Jewish culture was evident, with many describing their efforts and desire to serve organizations that preserved historical documents, worked to support Jewish infrastructure and educate children in the community. They felt that volunteering represented an important part of Jewish life and cited the importance of helping others within Jewish culture and religion. Tzedakah, a Hebrew phrase meaning justice or righteousness, was frequently referenced. Participants described the connections formed with their fellow volunteers and to the community. Friendships were maintained both within and outside of the context of the volunteer role. Caring for seniors was another common experience among participants. Many took on roles that involved working with older adults, whether it was making home visits to isolated older adults, or assisting with recreational programs. It was also found that participants gravitated towards leadership roles within volunteer organizations and, in some cases, had founded their own initiatives. Participants also found their volunteer roles to be an opportunity to engage in personal interests and hobbies, as well as a chance to use skills they learned during their professional careers. Volunteering is a highly productive way for older adults to increase their level of activity, foster their interests, help others and continue to be social and connected to their communities. 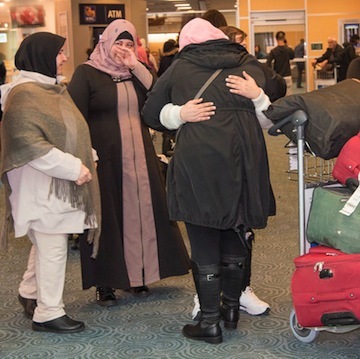 As Canada continues to diversify in terms of ethnic composition, it is essential that volunteer opportunities be made accessible to and inclusive of older adults from all backgrounds. To achieve this, it is imperative that future research in this area encompasses the experiences and stories of older adults themselves. Eireann O’Dea is a PhD student in gerontology at Simon Fraser University. Her research interests are related to community engagement among older adults, ethno-gerontology and environmental accessibility. She wrote her master’s thesis on senior volunteers in the Jewish community and has recently joined the board of Jewish Seniors Alliance. 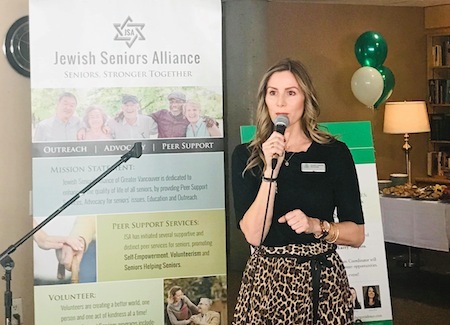 On the evening of March 6, Jewish Seniors Alliance honoured the recent graduates of its peer support counseling training program with the presentation of certificates and a dinner. Fourteen peer counselors completed the program, which consisted of 14 weeks of training for four hours on Sundays. 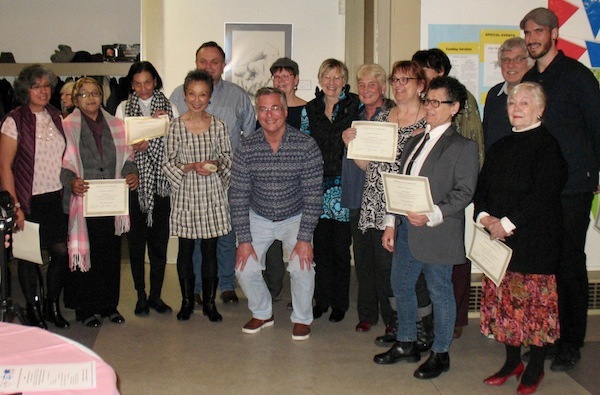 The certificates were presented by Ken Levitt, president of JSA, and the program’s trainer, Grace Hann, and social worker, Charles Leibovitch. Hann and Leibovitch also serve as support workers for the counselors. They match them with clients and stay involved with their progress and offer help when needed. Currently, JSA has 100 trained counselors volunteering to help isolated and/or homebound seniors. The counselors are usually seniors themselves and many have impressive education and experience in various fields. The graduation evening began with Hann and Leibovitch welcoming everyone. This was followed by comments from Levitt and Serge Haber, founder and president emeritus. Three of the graduates – Nancy Bell, Lorraine Drossis and Tessie (Fatima) Rebello – spoke about how much they had learned during the classes. They all mentioned that learning empathy and active listening had contributed to their personal growth. They thanked Hann for her getting them involved and participating in the program and with one another. Ruby Boychuk, senior peer counselor, offered remarks about seniors helping seniors and Nancy Bennett, another volunteer, was acknowledged for her contributions to the program. Speakers from the community thanked JSA for the extensive help that its peer counseling offers. Dr. Beverly Pitman of United Way spoke of the significance of the program to the community and emphasized the importance of lobbying the provincial government for more funding. Shelley Rivkin of the Jewish Federation of Greater Vancouver talked about the positive effects of the program and how it corresponded to the Jewish values of tikkun olam (repair of the world). Dorothy Leclair of Burnaby Seniors Outreach continued on the theme of the value of helping seniors and spoke about the Burnaby program. The final speaker was Kathryn Patterson of Vancouver Coastal Health. She asked the audience to close their eyes and hold hands, then to give one another a hug. It had the effect of relaxing everyone and making them feel as if they knew one another better. The ceremony and speakers were followed by a buffet dinner, and music and song by David and Julie Ivaz. Many of the graduates got up and danced. As they were leaving, some of the participants remarked that they had had a wonderful evening. Shanie Levin is an executive board member of Jewish Seniors Alliance and on the editorial board of Senior Line magazine.